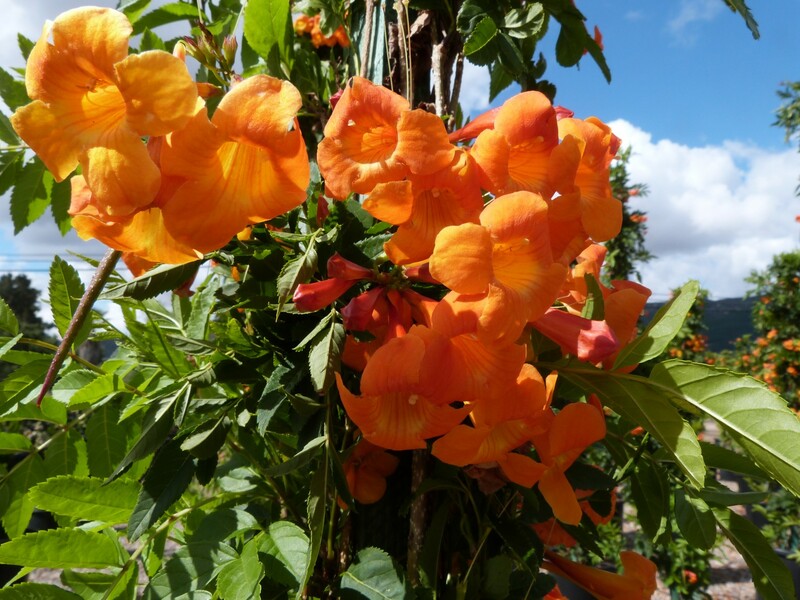 Tecoma ‘Orange Jubilee’, commonly known as esperanza, makes a beautiful blooming focal point in the landscape. This fast growing tender perennial quickly produces orange-red trumpet flowers beginning in spring that continue until the first frost. The bright blooms encourage hummingbirds and other pollinators to visit the garden. This esperanza looks great planted amongst other tropicals, in containers, or as a specimen plant in the landscape. It is considered semi-evergreen in mild climates and a deciduous tender perennial in cooler climates. In cooler climates, cutting it back each year will allow for new growth and will also remove any tissue damaged by frost. Tecoma ‘Orange Jubilee’ performs best in full sun and can tolerate a great deal of reflective heat. This fast growing esperanza is extremely drought tolerant once established and can tolerate a wide variety of soil conditions. It is rarely phased by pests or diseases, making this an even more attractive choice for your garden.